Productivity for an entrepreneur has lot to do with simplifying the chaos and creating a process to make sense out of it. The world is teeming with information; lots of information in fact and our humble mind can easily get entangled among this heap of data. The productive people are those who can create order out of this chaos; the one, who can simplify this complex inflow of information, make use of it for maximum advantage. It’s like accumulating hundreds of wooden sticks, and processing them, binding them to create one big solid wooden stick which has the powers of all small sticks combined together. This big wooden stick can do everything which several small sticks cannot do individually. This processing, refining and creating order out of massive chaos is what is required for maximum productivity. In the last chapter, we had mastered the Art of Collecting Information; we had learnt how to collect information which is being thrown at us from every angle. Now, it is time we learn how to create a process so that we can make use of this collected information in optimal way. One mistake which people often make while creating a process is that, they attempt to work in batches, focusing on the incoming flow of information and fighting it out to process it. No! You cannot and should not work in batches: this consumes more resources and the ROI of your time is at the minimum. Example being, you get lots of calls, emails, messages, posts, ideas etc in a single day. If you attempt to work on them individually, one at a time, then it will lead you no-where. Instead, create a process to manage this avalanche of information and data. But how? Collect the information as described in the last post, and then organize the ‘actions’ which need to be performed on this collected based on the ‘decisions’ you have made. This ‘decision’ is, infact the process which we are talking about. Once a process is established, you have made the decision as to what needs to be done with this collected information, and this will pave your way for maximum productivity. The collected information needs to be understood, as to what exactly it is. Say for example, you receive a mail from your Credit Card company that your spending limit has been increased. Well and good. Now, do you need to keep it in your basket? Do you want to use it afterwards? Decide on it, and proceed to the next level. Have a conversation with your own self, and decide whether the collected information is actionable or not. If its not, then either delete it, or put in a separate basket of ‘Some day or May be’ or ‘Reference’ list ( a separate list, which can be used as reference for anything, if any need arises). For the example of email from Credit Card company, I suppose I will just trash it! – Now, the most interesting part: Is the incoming information actionable? Example being a new idea for launching a new marketing campaign for your business. Yes, this is definitely actionable, and you need to now decide the next level of this. 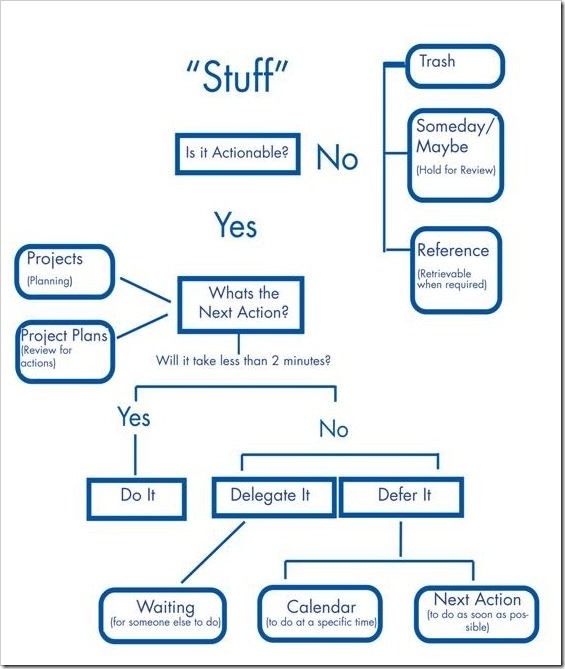 This actionable task can be completed in two minutes? If not, then it’s a multi-step project, and it should be transferred to the Monthly or Weekly list, and considered like a Project with proper planning. The new marketing campaign can be categorized under this Process. – If yes, that is this information can be processed in 2 minutes, then you only three options now: Do it right away ; Delegate it ; Defer it. – Say you want to post a new update on your Facebook company page. It will take less than 2 minutes, and it is very actionable as well. Hence, just do it right away and complete the process! – Say you want to post a new blog on your company website. You are not a Writer but an Entrepreneur. Hence delegate it to the concerned person and complete the process. – Sometimes, you can’t find a Writer at random, or need time to find one. In those cases, defer it for some other time. If you are deferring it, then choose either a Calendar or create a new list within the Weekly/Monthly List and enlist there. This will help you to remember it, and execute it. This completes the ‘Process’ of your Work Flow; you have successfully carved out an Order out of Chaos, and helped your productivity levels to soar up in the sky. I would again remind you: Initially, this whole process chart may appear as way too cumbersome to achieve and do. But remember, after one week of creating such a process, it will hardly take you 20 seconds to create such Process and complete it. In the next post, we shall discuss ways to “Organize” this flow and the incoming information for maximum leverage and getting maximum productivity.